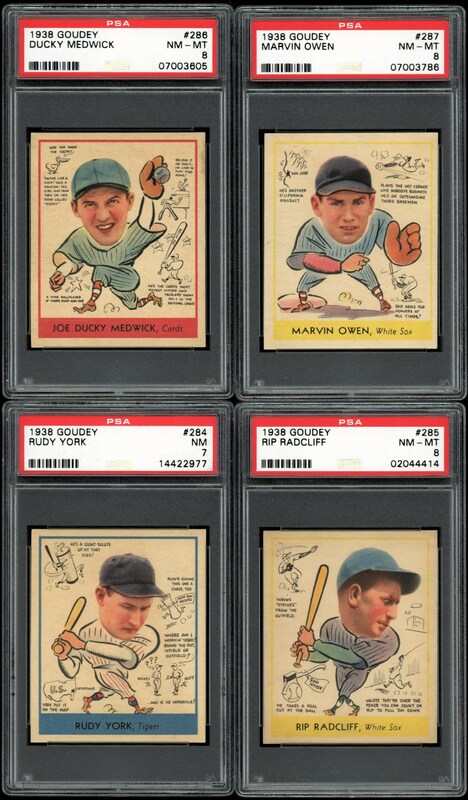 Lot # 91: Super High-PSA Grade 1938 Goudey “Heads Up” Near-Set (45 of 48 Subjects/93.75% Complete) w/a Spectacular PSA 8.08 Weighted G.P.A! Super High-PSA Grade 1938 Goudey "Heads Up" Near-Set (45 of 48 Subjects/93.75% Complete) w/a Spectacular PSA 8.08 Weighted G.P.A! 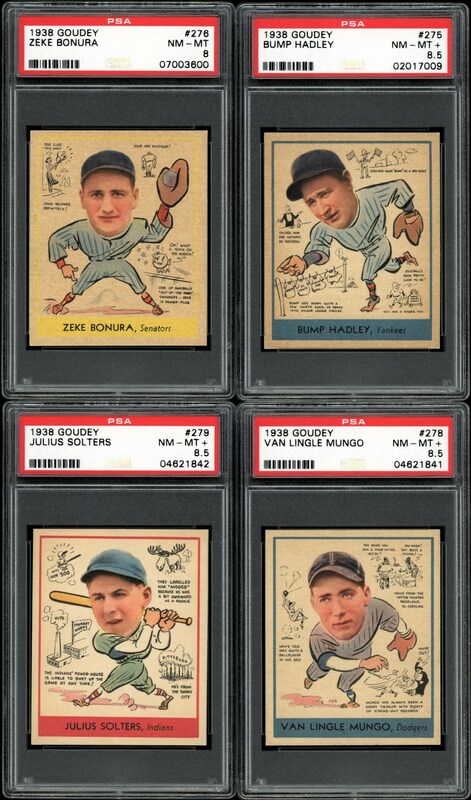 One of the most popular pre-WWII bubble gum cards are the 1938 Goudey "Heads-Up" cards released in 1938 by the renowned Goudey Gum Co. of Boston, Mass. 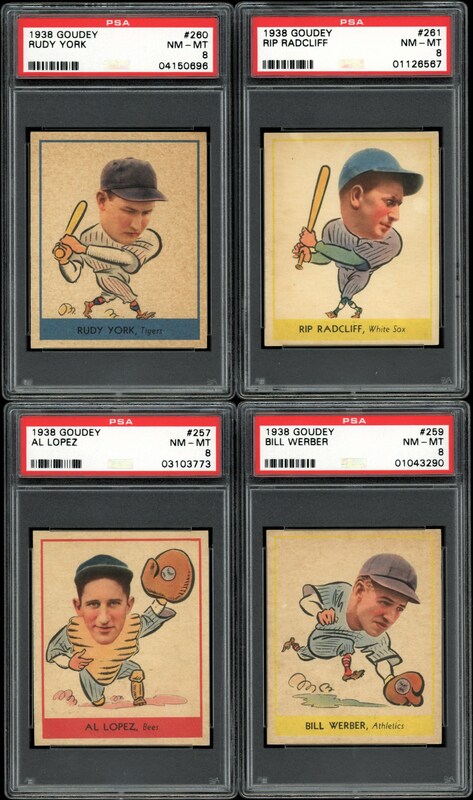 As a continuation of the 1933 set that number 240 players, Goudey started the 48-subject 1938 set at checklist#241, ending the set with #288. 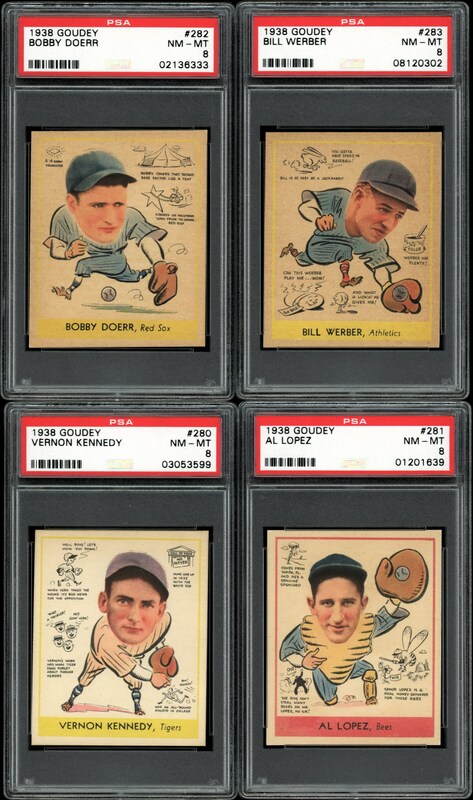 The cards included a real photo color image affixed to a caricature body, with the second half of the set repeating the first 24 players, including miniature black printed cartoons and player facts around the primary central image for checklist #'s 265 – 288. 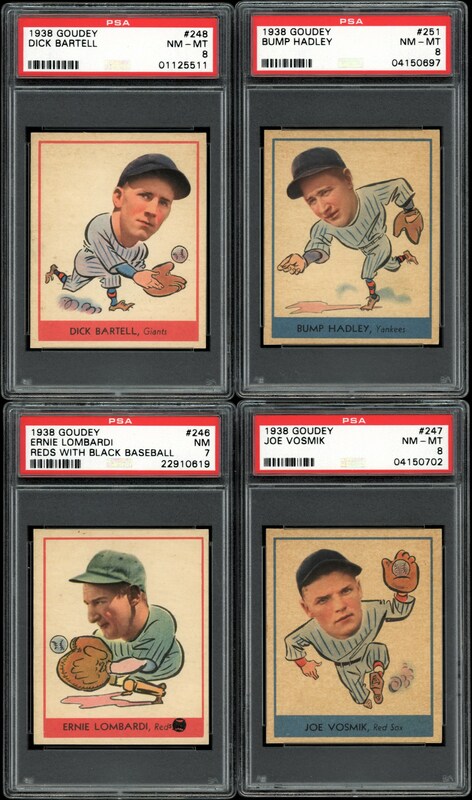 High sought after by the hobby's esteemed collectors are the Joe DiMaggio & two Bob Feller subjects that both represent "Rapid Bob's" highly coveted American issued rookie cards. 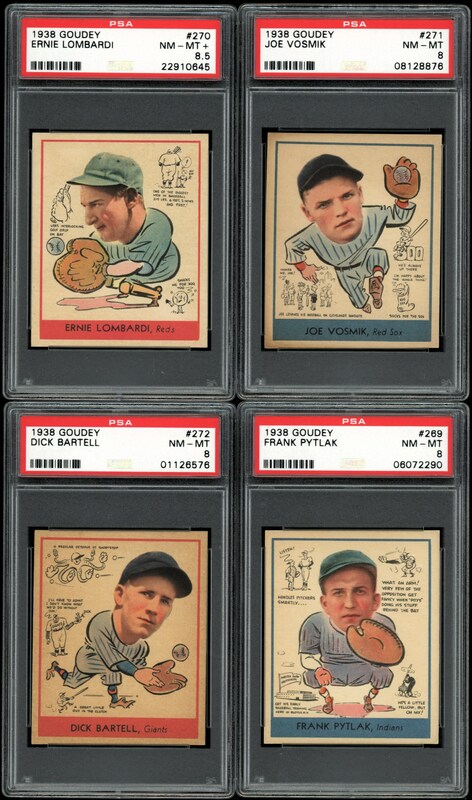 Presented here is a near-complete 45-card compilation, with all 45 subjects graded by PSA and carrying a sensational 8.08 Weighted G.P.A! 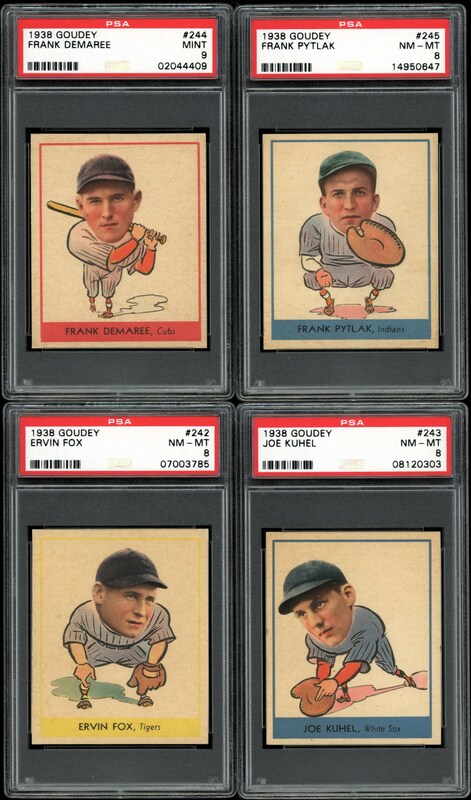 The only three missing cards are the two Foxx subjects and #250 Joe DiMaggio, with every card reflecting a PSA Assessment of "NM 7" or better. A breakdown of the grades are as follows: Mint 9's (2 Cards); NM/MT+ 8.5's (7 Cards); NM/MT 8's (34 Cards); NM 7's (2 Cards). Indeed, a remarkable 34 or 76% of the total 45 cards have managed to receive a PSA NM/MT 8 assessment! The PSA Population report substantiates the fact that this is no "small" achievement with only 7% of the total 5,400+ population reflecting "PSA 8" grades, and only a microscopic 0.4% depicting a "PSA 8.5" assessment (there are 7 PSA 8.5's in this 45-card offering). The incredible statistical prowess of this near-impossible high-grade gathering also offers some extremely imposing PSA Population data. Consider that of the 45 subjects, an amazing 22 reflect grades that have not been bested by a single subject (0 "Pop" Higher), and 18 cards reflect grades with only a SINGLE higher example (1 "Pop" Higher). 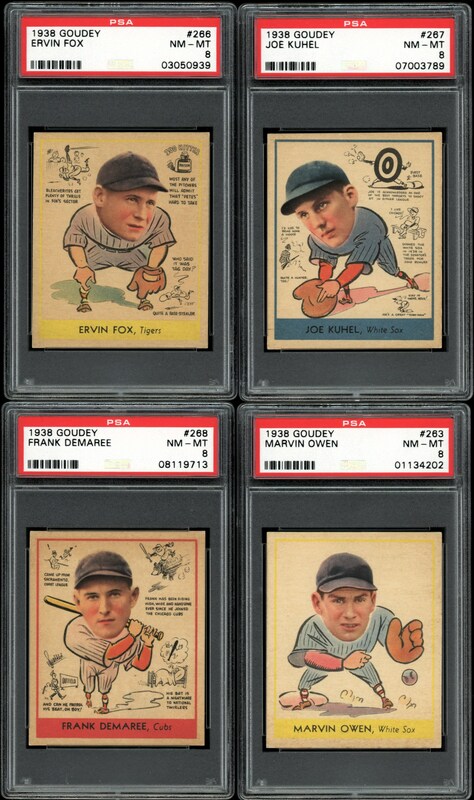 Therefore, an unfathomable 89% of the 45 cards are either the "finest of their kind" (22 cards) or been bested by only a sole example (18 cards), with 2 of those highest graded examples residing as "1 of 1's (#256 Kennedy & #265 Gehringer)! 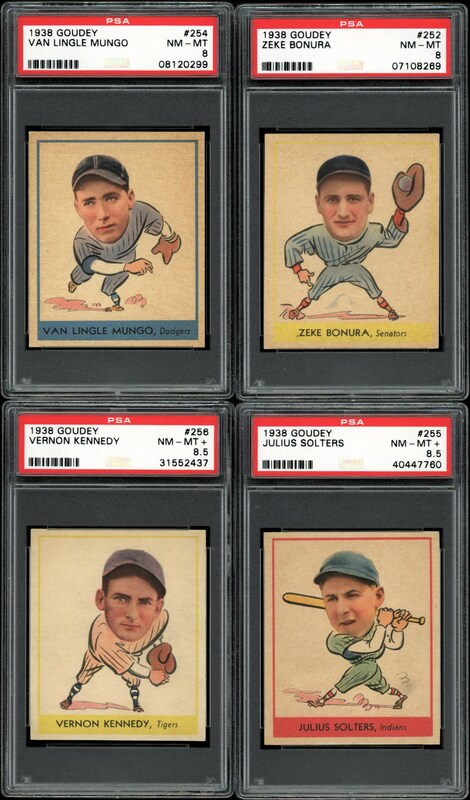 Miraculous to say the least, compiling such a seemingly incomparable 1938 Goudey near-set is no simple task since high-grade examples seldom surface for the taking, let alone a gathering including 45 high-grade cards!